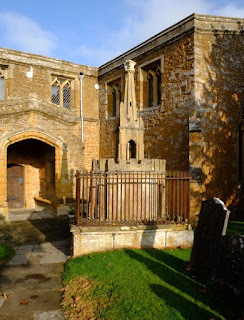 I’d not got far up the churchyard path to St Mary’s, Ilmington, before I saw the extraordinary monument near the church’s south doorway. Once I was a little nearer I began to take it in, and to see what it was: an 18th-century tomb (the date is 1750, it turns out) that aspires to be a miniature building, with a lower section parapeted with castle-like battlements, and the whole thing topped with a lantern-tower and spire. The masonry of the lower part looks plain at first sight, but close-to one can distinguish some pilasters at the corners topped with tiny cusped blank arches, while the battlements are decorated with quatrefoils that have partly weathered away. The tower is quite elaborate – there are cusped openings all the way around and the spire also has (tiny) windows and a carved finial at the top. It all looks more like the mid-18th-century Gothic that it is, and yet the highly fancy Gothic that Horace Walpole promoted had really only just going – Walpole had begun to remodel his famous house at Strawberry Hill in 1749. So who created this forward-looking bit of design? It was built for Ann and Samuel Sansom. Pevsner compares their tomb to the Despenser monuments in Tewkesbury Abbey, and it’s true that some of the Tewkesbury chantry chapels do have similar, if much more ornate, tops. He also directs us to the researches of Howard Colvin, who points out that the Chipping Campden mason-architect Edward Woodward had proposed a similar design of tower and spire, at full scale, for the church at Preston-on-Stour. * It could well be Woodward, experienced in building plainer Gothic structures not far away from here, trying his had at something more adventurous. If he did, it was admirable, although as I attempted to photograph the miniature building I had to try several angles so as not to get the spire clashing with window mullions and tracery behind. And then it occurred to me that the tomb was sited rather invasively near the church and its entrance. I wondered what the parishioners thought when they had to pass it every Sunday? I like it, but it must have been a bit of a shock, and an enforced reminder of the deceased couple. Let’s hope they were remembered with affection. * The Woodwards – Thomas and his son Edward – were certainly on the ball: they were doing very rococo Gothic work at Ascot Park, Warwickshire, in the 1750s. Their proposal for the Preston-on-Stour tower showed a crown-like top like St Nicholas, Newcastle, with the finial designed in the manner of the tomb at Ilmington: amazing. For a reproduction of the drawing, see the recent revised edition of the Warwickshire Pevsner. Could it be Residual Gothic - looking backwards rather than forwards - rather than anticipating Strawberry Hill "Gothick"? Only about half a century before, Wren was still making Gothic churches in London, I think. Lots of Late Gothic still around in the area to model from. 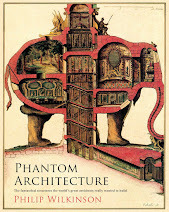 Unlike Pevsner, I don't think a creative artist has to be "true to the period": I think creativity can think outside the box. It seems somebody did here. In response to Joseph Biddulph's point the church of Kings Norton in Leicestershire straddles the line between late Gothic tradition and early Gothick revival. 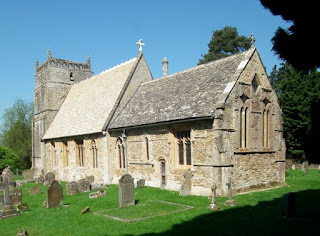 The church of St John he Baptist was built to the designs of John Wing the younger for William Fortrey. It was started in 1760 and completed in 1761. The Wing family had been stone masons for several generations before becoming architects. It seems safe to assume that they had a good practical knowledge of Gothic architecture from repairing local churches. How much the design of the church comes from that tradition as opposed to the fashion for Gothic revival is a matter for debate. Very interesting comments, both. 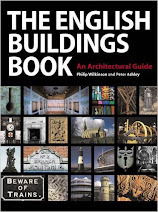 I am particularly taken with the idea that a builder or architect could be immersed in the local tradition of Gothic (especially if the mason concerned is from a family such as the Wings or Woodwards) and also influenced by new fashions coming from London and its environs.